Photographs and photographers were present from the very beginning of the Victoria and Albert Museum’s history. In 1852 the South Kensington Museum (now the V&A) became the first museum to collect photographs and in 1858 was the first to exhibit them. Henry Cole, the visionary founding Director of the Museum, saw early on the potential of photography to dramatically extend the visual range of resources available to artists and students and actively sourced photographs for this purpose, supplementing a variety of existing reprographic processes and formats. The photographs, which were initially part of the collection of the National Art Library, were to be used by professors and students as well as by the officers of the various sections of the Museum. Overlooked until now, female photographers were employed by and played an important role in the Museum’s mission to use photography for these administrative and educational purposes. While the Museum had its own photographic service and photographers, including Isabel Agnes Cowper, it also sourced photographs from independent professionals, including those working abroad. Louise Laffon, the third female member of Le Société Française de la Photographie, produced a series of photographs of objects from the Campana Collection in the Musée Napoléon III in Paris (now the Louvre). In 1864, the V&A purchased 500 works from this series from Laffon through the agent Monsieur E. Cappe. A few examples of Laffon's original gilded mounts survive. These are of particular interest in that they highlight the way in which Laffon masked her gender, each mount bearing the gender-neutral stamp of 'L. Laffon' along with the name of her studio, 'Photographie Lord Byron' (a reference to the street on which her studio was located). 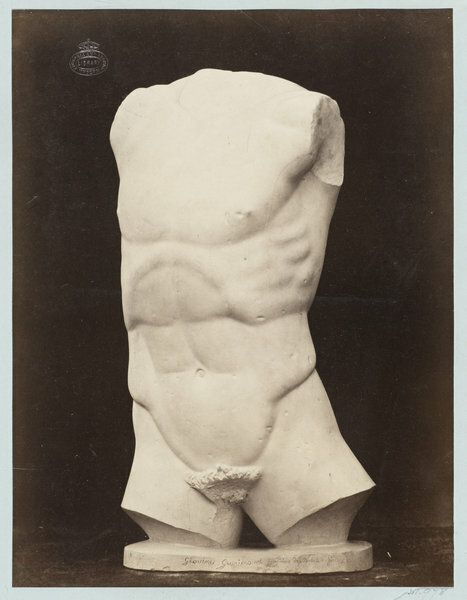 This is one of 500 albumen prints in several series originally purchased from the Parisian photographer Louise Laffon documenting architecture, sculpture, ornamentation, terra cotta and marble from Le Musee Napoleon III, originally part of the Campana Collection. Photograph from a set by Louise Laffon from the Musée Napoléon III fifth series. This set contains a hundred photographs of sculptures in marble, terracottas, Antique bronzes, etc. in the Campana collection. Longpérier, Henri Adrien Prévost de. Le Musée Napoléon III. Architecture, Sculpture, Ornamentation, terres cuites et marbres de l'ex-collection Campana. Cent planches d'aprés les clichés photographiques de M. L. Laffon. Lithophotographs et imprimées per M. Lemercier, accompagnées d'une introduction et de tables explicatives par A. de Longpérier. Paris: 1864. Laffon, L. Table de deux cents épreuves du Musée Napoléon III. 2ème et 3ème serie des épreuves. Paris: 1864.